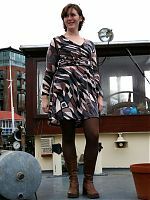 Continuing on my quest for more long sleeved tops and dresses as the weather turns decidedly chilly here in London, I’ve pulled out KnipMode 09/2010 #11 from my stash for a quick and versatile knit dress. 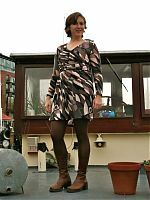 The dress is a pretty basic shape – a rectangular skirt (same for the front and back) at a gathered waistline with a basic V-neck bodice and long sleeves. But the twist is that there are two triangular waistband pieces in front to help cover that waist seam, visually cinch in the waist, and create interest in an otherwise basic dress. And I had the perfect fabric – when we met up with Karen for drinks when we were in Philly a few months ago, she brought me this lovely and soft poly/viscose/lycra(?) jersey for me as a gift! How nice! So I thought it’d make the perfect winter dress. I made a few changes to this pattern, though. The obvious one is that I added a waistband in the back. It seemed really strange to me that there wasn’t one included, and it felt weird that the waistband just stopped at the side seams. So I just made a turned rectangle and gathered the edges so it matched the front waistband at the side seams. I also shortened skirt by about 5 inches. I prefer my skirt lengths to be above the knee, and especially with dark colours and winter dresses, I feel like they should be shorter to take some of the visual “weight” off. And the long sleeves mean I’ll only ever be wearing this with thick tights, so why not go shorter? The only thing I really don’t like about this dress is that the waistline is a bit too high for my liking, and the upper attachment point on the front waistbands seem way too high. Even though I basted the side seams before overlocking, I failed to notice this, and I’m too lazy to unpick all those threads and pull that down so the front belts are less tall at the side seams. But you could make this change! This dress also involves a lot of gathering stitches, which takes a lot of time, only to find out when you construct the seams that most are hardly gathered at all so you could really just forgo all the gathering rows and just stretch the fabric a bit as you overlock to get the same effect. 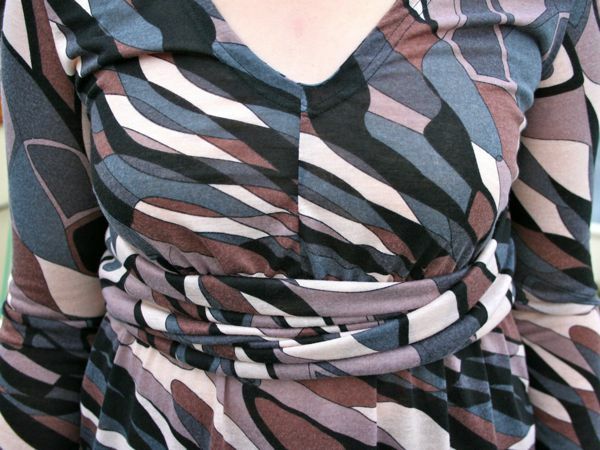 If you wanted to use this pattern as a starting point for sewing your own version of the engagement dress above, you’d first have to change the front bodice into a surplice (cross over) neckline rather than the current V-neck (so just extend the neckline past the vertical centre front seam line into a sweeping triangle). I also found the waist seam on this to be really high (almost empire) so you’ll want to lower that by a few inches, too. But most importantly, you’ll have to make those waistbands way shorter and tighter. 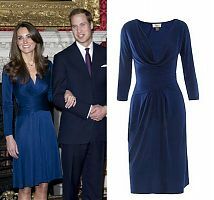 KnipMode’s is a pullover dress, but looking at how tight Kate’s waistbands are, you’ll almost certainly need an invisible zipper in a side seam if you want the waistbands to be as snug as hers. And this probably goes without saying, but you’ll want an exceptionally thin lycra jersey for those drapes, or if your budget can stretch to it, silk jersey! I used a poly/viscose/lycra jersey here and the waistband actually adds a bit of bulk to my waist (not really the look I was going for, but oh well!). 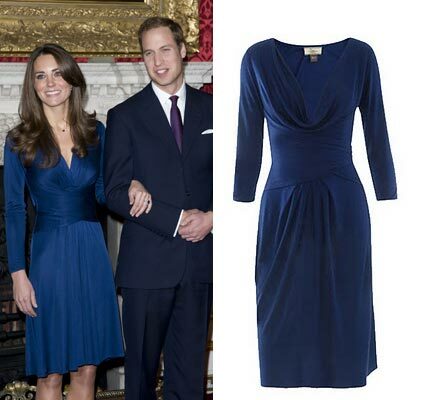 A lighter weight fabric like silk jersey would keep the lines of the dress slim and form-fitting. 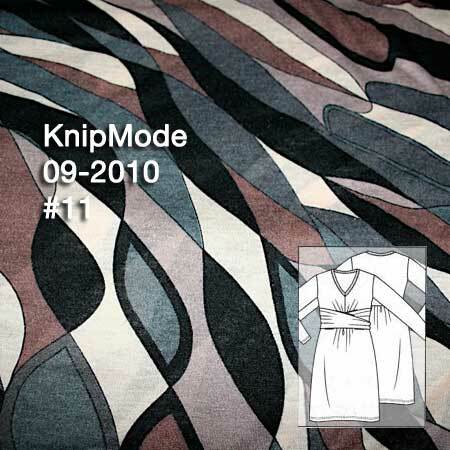 Separator image Posted in Gallery and tagged with dress, knipmode, knit, knockoff.